Slow and Steady Wins the Race . . . .
As I have had to face our family’s latest health struggle, I am fortunate in my belief that all will be good. Mottos or personal philosophies help us muddle through life’s challenges. In this case and in the case of so many health challenges, I find myself trying to remember that ‘slow and steady does win the race. The question is how do you go through life’s challenges when everyone around you expects instant gratification. Those folks that care are always asking the loving question, “How are things going? Are they any better?” Those loving questions make a difference in my life. The questions remind me that we aren’t alone and even if we feel that way, people care. And yet they often frustrate me because healing and challenges don’t resolve themselves as quickly as one would hope. For most of us, healing doesn’t happen overnight. In my case, I look at healing in the same way I look at hiking. When I hike, I often struggle because I have two left feet, but I still hike as often as I can; I push myself even as I grow frustrated at my lack of stamina and coordination. I love the solitude of being on a trail by myself or with just one other. And with each step I find a new foundation, a new view, and peace; sometimes those steps lead to falls, trips, or struggling moments. Once on a trail, I have to face what’s in front of me and focus on the goal of reaching my destination; the same can be true for each step we take on a healing journey. Remembering to take one step at a time helps my journeys seem more manageable. 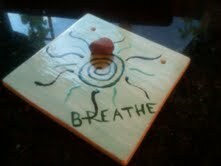 Taking time to take deep, cleansing breaths also helps. For me slow and steady wins the race every time. May this truth hold true always. A few weeks ago, I found what has become my bet rock. Feel free to laugh at me; I am. Yesterday, as I was moving through a rather challenging day, I found myself needing to touch base with that rock which for some reason I was carrying with me in my pocket. So I did. Throughout the day held the rock in my hand; sometimes I just touched the outside of my pocket to make sure that the rock was there. I love how this little rock has become my teacher. The sweet little rock reminded me that I had to stay strong and that maintaining my foundation was an important need too. The beauty of the rock reminds me that I have live with inner beauty and integrity. I have to walk gently in a loving and sweet demeanor. 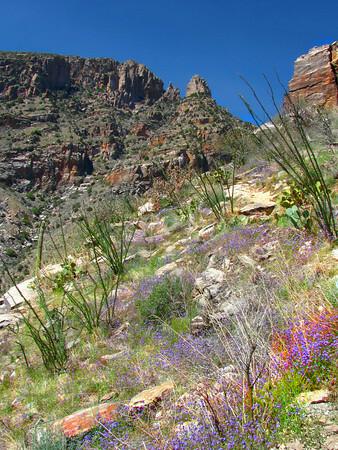 The earth is profoundly beautiful where I live in Tucson and the surrounding areas. As long as I remain grounded in this beauty all will ultimately thrive. My life has felt overwhelming as I have had to navigate some difficult challenges lately. In truth, internally I am struggling, but the rock reminds me to stay focused and present. My foundation is strong and getting stronger. All will be ok; it always is for me. Amazing how a small rock has such empowering energy. I love the rhythm of my body. Each morning, I naturally wake up an hour or two before the sun. My body eases into the day without distraction and without struggle. No one has expectations of me and the dog isn’t ready for her morning walk or attention. Life is good. In the morning, I can write, chant, drum; I can be lazy, look out the window, or go back into a light slumber. I can listen to the animals, the birds, or the wind. The energy of honoring my body is probably one of the reasons I can walk around with a smile on my face even when I face challenges. 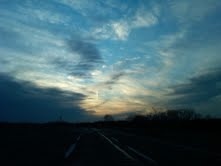 Morning allows me the time to collect my thoughts, find balance, and gently move into the day. The rhythm of the earth has always been nurturing for me. I love my quiet time; I love my space. As much as I love my family and connecting with people, I also love the silence and walking gently. The cocoon of darkness yields a beautiful light propels me into the day and into the world with others. Taking that trek slowly is the gift I give myself. 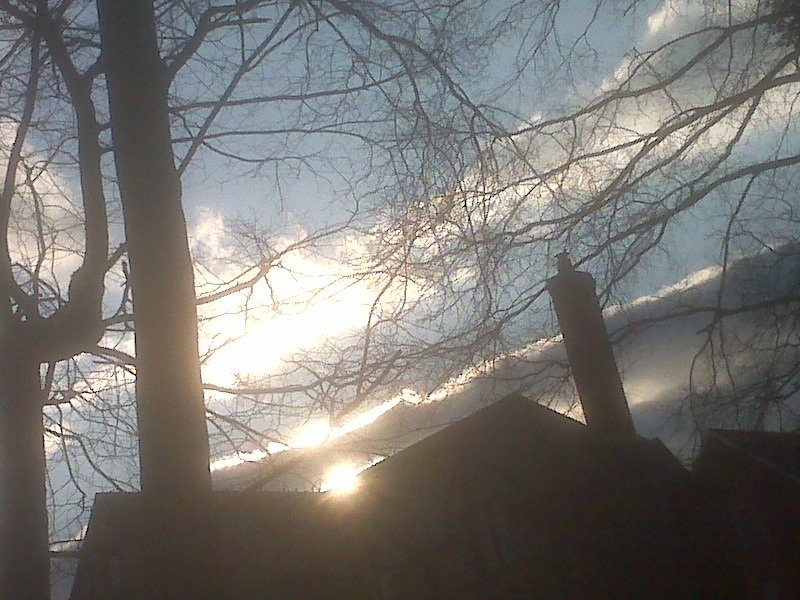 Good Morning; (AH) Morning Light Everyone! Intimacy happens when you have a deep and passionate relationship with someone or something outside of yourself. Over the course of my life, I have amazing relationships that have sustained me and brought me to this time. When I am in love with those around me or with something I believe in, a beautiful intensity flows through me and my world feels spiritually healthy. When I lack intimacy, profound sadness takes root and living becomes a little harder. I thrive on intimacy; it is through intimate relationships that I am able to feel whole as a human being. Loved ones nurture me and help me become my best self; beliefs allow me to strive for integrity and help others to do the same; wandering in the great outdoors keeps me rooted in the earth; and writing has been my one and only constant through most every day of my life. While I love mothering and being a friend; I love my work and all of my many interests. I love life. Unquestionably. Writing is part of each and every one of those connections; writing transcends those connections. Moving to the desert and walking in the great outdoors here has empowered me both physically and emotionally. With each step in the desert, I find an even stronger desire to write and to reach out with my words. The birds, the land, the insects, and the people are all reaching out to me and inspiring me to soar through my words and through my body. I want to walk, to dance, to run; I want to write and write some more. I can’t help but breathe deeply and hang on for the new experiences that await me. The beauty of this land inspires me to grow as a woman and a writer. Through writing, I have come to understand life with all of the intricacies. I have handled life’s biggest gifts and painful losses. With each word written, I explore my dreams, my hopes, my decisions, and my feelings. With each word, I unlock what is often hidden below the surface. All of my writing comes from my soul. Under the shroud of darkness, writing comforts me. When I am bursting with joy, my writing joins me for the ride. And when I encounter questions of the soul, I write to find the answers. Over the years, my journals have become my closest confidants. Those relationships have sustained me and allowed me to thrive as I remain in touch with my essence. For a time, I lost my ability to write when I experienced someone going through my writing. Re-creating the sacred space that writing held in my heart took many years and many tears. I had lost my safe space; I had lost the cocoon that had protected me for so many years. Finding my voice again is a continuing odyssey; today I write through the vulnerability so that I am no longer silenced. The good news is that while I did become silenced as a writer, I did ultimately find my voice through chanting and drumming, and through beautiful connections with loved ones. Even though loss often feels devastating, even burned forests can thrive again; it just takes time. I write to process life, to actively engage in life and to create new rhythms for moving forward within life. I write to gain a new foundation and to find balance. Ultimately, writing is one of life’s antidotes for inner peace and balance. With every ounce of my being, I pray that my very intimate and beautiful relationship with written word is never halted again. May the remainder of my life allow me the sacred space and sacred ability to weave words together sometimes for others and always for myself. Is what makes me One! As someone who has lived throughout parts of the United States and who has had the opportunity to actively engage in some national organizations over the years, Facebook offers me the chance to stay connected to those that have touched my life since the beginning of time. Over the last couple of years, I have often been touched by the love and support I have received via Facebook. When illness struck, I asked for prayers, support, visioning. In response, the love always flowed. When I needed to find out information or insights, friends shared useful information. When death or loss struck, my friends offered condolences and warmth. When I began my journey to health, my friends supported me and gave me tools as needed. When I needed to laugh, my friends shared stories. When I needed an old friend, I could easily reconnect with someone that knows all of me. When I wanted to know more about what was going on in the world or to find articles worthy of reviewing, links are plentiful. When I wanted company as our family moved away from DC, my friends traveled with me nearly every mile. When I wanted to share my writing through my blog, my friends pulled the link off of FB and took a few minutes to read what was on my mind. When the debate was going on last night, I was able to gain insight into so much of what I was hearing through the different thoughts that were shared on many of my friends’ status lines. Compiling the list above made me laugh. I kept asking myself should I write this list in past or present. In truth, Facebook is ongoing. I have become a better friend because of it and meaningful friendships have been sustained while others are born on Facebook. I have stayed in touch with so many people that I love, but would not be able to stay connected to if Facebook didn’t exist. Facebook keeps me connected to those I adore, those I want to know more, and real friends. As much as I love Facebook, it is also a tool for staying connected; it is one of many tools. Picking up the phone, texting, sending an email (or even a snail mail) is more personalized; my goal this year is to do these things more. Waking up yesterday morning, I was able to see who woke up smiling, who woke up a little grumpy. I was able to learn of the rain and another friend’s horoscope. I love knowing what jazzes people and what annoys them too. But at the end of the day, Facebook doesn’t share the whole story; it shares the parts that our friends choose to share. I love the gift; I know the limitations. I love when people tell me that they know how I am through my Facebook. While I don’t think people know the entire picture, they do know that which I share. The challenge is that all of us evolve over the course of the day, so what you think is significant upon reading, might have changed dramatically after ‘an incident’ at work or after a great lunch with a friend. This makes me laugh; FB has proven that many of us have a multiple personality disorder. I love what Facebook has to offer!! Now I have to remember to engage in an old-fashioned phone calls, to send an email or a text more frequently, and to be more present for those I love when time allows. Don’t worry, I will always share how much I love the moon, the stars, the sun, and the sky. On Facebook, I have the audience! Love knowing that what I say matters even if it is only for a moment. Celebrating a birthday on Facebook is the best; both receiving birthday wishes and giving them! Gotta love Facebook – I do! We live in a broken world. Inside us there beats a heart that has been broken more times than we’d care to remember, but there will always be someone to help us pick up the shattered pieces and begin the process of repair. Sometimes with glue, sometimes with love, sometimes with miracles. Always with God. Washington DC skies following a storm. My son is sick. And it could be very simple or not. We don’t know, but we are navigating the both modern medicine and alternative medicine. That’s what we do. For over three months, he has been plagued by pain; the last 6 weeks have been out of control. In my heart, I believe that all will be good; the journey might be difficult, but we are handling the current reality. Last night, as I sat in a circle of new and loving friends, I felt caged; I had to get away. Everyone was asking questions, sharing the curiosity, and offering insight. All I wanted to do was dodge the conversation not because I didn’t want to share per se, but because sharing makes me re-live the pain and sadness again and again. Throughout our lives all of us will experience periods of mental and physical challenges and periods of mental and physical health. This is reality. Personally, I have been blessed with both and my guess is that you have too. In my reality, I have faced critical illness multiple times for my children. Life threatening and ultimate survival has been our experience. For the most part these experiences have taken years to recover both the physical and emotional trauma. Being a friend to someone who is experiencing ill health is not easy. And each family being challenged or plagued with chronic illness deals differently. The one thing that I know is that words have power, so saying less and asking less is often what I need from others. I want to know you care, but I don’t want to share each day, each ache, or my fears. Once I share, the realities loom in front and the emotions flow; what I need is to navigate the realities and to stay focused on what I hope will be the end result – HEALING. Trust that I will share the details if I want to share the details; don’t ask. When my older son was ill, everyone wanted to know his prognosis. There was a chance he might die and I didn’t want to say those words. If there is something you need to know the grapevine will ultimately work by design. Each experience is unique, don’t share your experiences with a similar illness. If I need your insight, I will ask. Unsolicited experiences lead to fear mongering. Trust that I am getting medical help and if I need help finding a different practitioner, I will ask for guidance. Smiles and hugs make a huge difference in how we walk through the day. You can ask how we are, but don’t dig for answers. I will share when it feels right. Remember I don’t want to feed the energy of illness. Offer food or hanging out opportunities. Having someone who doesn’t feel good in the house takes a lot of energy. Don’t judge how individuals are handling their journey. Don’t hold abruptness or grumpiness against the ill people or their care takers. Pray and vision for good health. And when health looks depleted, pray for those that are being challenged to find balance or peace within the storm. Caring is a form of art; what works for you isn’t what will work for me. Saying less will allow those in need of healing to maneuver their journey. While the journey can be long, it is what it is. Sukkot is one of my favorite holidays. To me, it represents finding the gifts in life as well as valuing the simplicity of what is. While we can say that Sukkot סֻכּוֹת is a biblical harvest holiday celebrated on the 15th day of the month of Tishrei and is also known as the Festival of Booths. Sukkot is also the holiday of profound symbols that remind us of how important is is to walk through the world consciously. As a both a Youth Education Director of Temple Emanu-El Kurn’s Religious School in Tucson and as a mother, I thrive on the symbolisms of Sukkot; in recent years I refer to each symbolism as life’s metaphors. While each symbolism has a name and concept associated with it, they can also be an awareness for what’s most important in life. 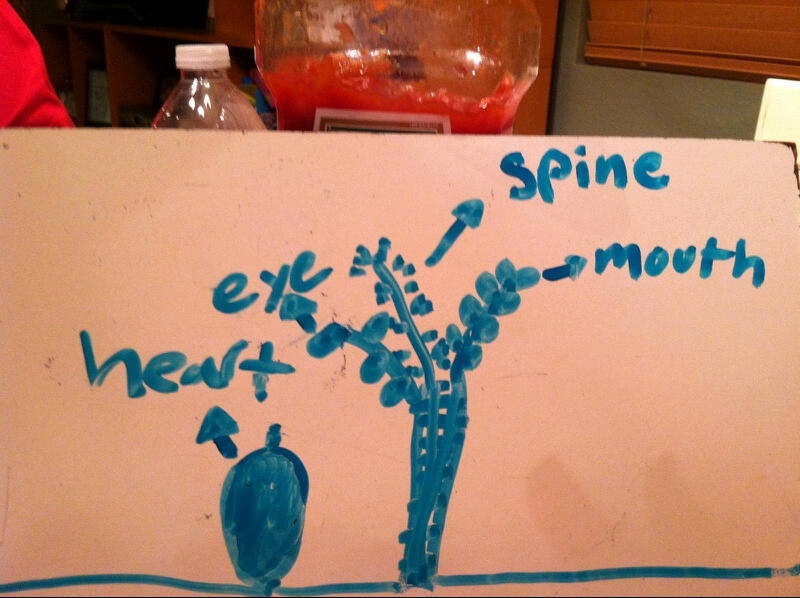 This reality was brought home to me this week by one of my third grade students Selina Feldman who drew a picture for her parents showing what she learned about Sukkot during Religious School. What does a lulav and etrog really represent? The irony of this picture is that Selina did not refer to these symbols as the four species, she responded more to the explanation of the methaphors. For more info see the below link. Stand tall like the palm; each of us have a spine. Remember to look at the world through open eyes; the myrtle might look plain, but it smells divine and is shaped like our eyes. We have lips to speak; may we use our words wisely. The willow appears to be a simple shape, we have the responsibility to talk gently and honestly; watching not only our words, but how we use our words makes a difference to those that experience them. Each of us are blessed with a heart. The etrog reminds us to move forward with an open heart and to be kind to others as we walk in the world. I find it fascinating that Selina only noted the symbolism and not what the symbolism was called. As an educator it made my eyebrows rise; as a human being I am profoundly proud that she understood the metaphors. The second major symbol that touches me is the sukkah. 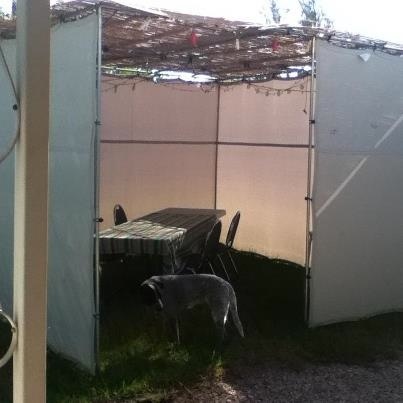 A sukkah (shown below) reminds me of my love of voluntary simplicity; living consciously within both my values. In fact, I will be giving a workshop on that in mid-November and early December as part of our Adult Education offerings at Temple Emanu-El. ‘Ufros Aleinu Sukkat Shlomecha ופרש עלינו סכת שלומך — Spread over us Your shelter of peace’ is a verse from the Hashkiveinu prayer which Jews say during their evening prayers. It also a song that is sung again and again throughout the holiday of Sukkat. When when I think about the sukkah and this song, I find myself reflecting on my desire to create both a positive Religious School environment and loving home. This happens when a community and a family come together as a team. Together we can co-create a sukkah, a structure that feels complete and peaceful too. May each of Sukkot’s symbols make us more thoughtful of our roles in the world. In most every way, we make a difference when we realize that how we walk in the world can make a difference for good!